I plead guilty to writing an attention-grabbing headline. Fear not as there are no plans as yet to build a nuclear power station on the North Norfolk coast. You may, however, be somewhat surprised to learn that it has been seriously considered in the past. During the late 1950s research was conducted into possible UK sites for nuclear power stations and North Norfolk was on the list. One location investigated was at Weybourne – presumably the piece of land then owned by the MOD, that is now occupied by the Muckleburgh Collection. It fitted the criteria then set: deep water close inshore and a sufficient distance from any major centres of population. The topography was also suitable but there would have been some concern about coastal flooding after the inundation experienced in 1953. This would not have been an insurmountable problem as there are several areas of high ground just inland of the marshes that would have been equally suitable. 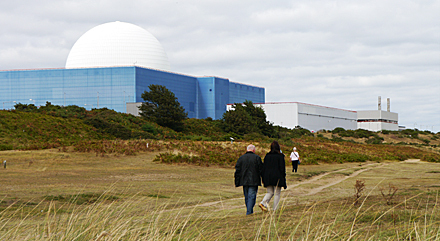 Anyway, it never happened, as Sizewell near Leiston in Suffolk was considered to be a more suitable location. Is it possible that a nuclear power station would ever be built in North Norfolk? I do not believe that it can be ruled out completely. As the nation’s demand for power increases and “peak oil” is reached (some experts believe we have already passed that point); natural gas becomes even more expensive and the North Sea supplies start to run out; renewables cannot meet demand and burning coal is not an option due to global warming, what then? Will there be a rush back to Nuclear before we reach that point? Construction of the Sizewell (A) gas-cooled nuclear power station was commenced in early 1961 and it operated without any problems until generation ceased in 2006. In 1988, after a major enquiry and much public protest, construction work on Sizewell B PWR (pressurised water reactor) was started. It came into full production in February 1995. The power station’s generating life is to end in 2035, although the owner, the French company EDF Energy, hopes to extend its productive life beyond that time. • How are we to cope with the ever-increasing demand for electrical power? • Will new locations, such as North Norfolk, be considered as nuclear power station sites at some time in the future? • How can we generate adequate electricity whilst reducing carbon emissions and our reliance on fossil fuels? • Three Mile Island, Sellafield, Chernobyl and Fukushima – will these nuclear accidents influence public opinion to the extent that the construction of new nuclear installations – particularly at new sites – will be met with great opposition and hostility? It is therefore a fact that nuclear power will continue to play an important part in the overall energy generation mix of the UK for the foreseeable future. Cleverly though, the government has managed to distance itself from the political ‘hot potato’ of the future development and siting of nuclear installations by placing this into the laps of the private sector. Since the 1950s the demand for electricity in the UK has risen steadily. As our manufacturing sector contracted and the power consumed by the traditional ‘metal bashing’ industries reduced, the demand for electricity rose in other areas. New domestic appliances proliferated and the power consumption of British homes started to grow. From the 1980s onwards the desktop computer came into general use. Thousands of the units appeared in offices and other workplaces. This was followed by the development of high-tech mobile devices all of which have to be charged from the mains supply. When we plug our mobile phone into the mains to be charged we do not give a thought to the sixty million other phones in the country that also need to be recharged on a regular basis. Add to this all the iPads, iPods and computer games’ machines, plus the domestic entertainment systems that we are all now familiar with, and you will realise the scale of the problem. All around us as we go about our everyday lives are devices and machines that consume electricity. The population of the UK is still growing, and housing development, although slowed at present by the economic recession, will continue, increasing demand for electricity even more. How will the UK cope? Going forward the energy production capabilities of the UK must increase. The recent power blackouts in India illustrate what can happen when supply cannot meet demand. If faced with power cuts the British public would be unforgiving and the government of the day would be almost certain to fall. It is a fact that if this ever occurred the niceties of how the power was generated would not figure highly in the minds of the British public. If the TVs would not work and the houses were plunged into darkness, whether the electricity was produced by turbine blades spinning around out in the North Sea or by a PWR in North Norfolk would be immaterial to the majority of individuals. If like me you spend a lot of your time on the coast, you will have watched as the Sheringham Shoal wind farm has gradually taken shape some 20 kilometres out in the North Sea. When the project was started my main concern was the possible effect on birdlife. The RSPB has investigated this and thankfully they do have an input when planning applications for new installations are considered. The recent application for a wind farm at Docking Shoal was rejected because of the possible effects it might have had on the sandwich terns that live on The Wash. When Sheringham Shoal is fully operational it is estimated that the 88 turbines will generate approximately 317 MW of electricity, enough to power 220,000 homes. They will cover an area of 35sq kilometres. The total cost will be between 350 and 400 million pounds. How does a renewable energy source such as Sheringham Shoal shape up when compared with nuclear generation? • Once the difficult and expensive task of actually putting the turbines into position is complete the source of energy is completely free. • There is zero pollution of the environment. • There is no waste to dispose of. • The North Sea is very windy at times but not always. If the wind does not blow the turbines cannot generate electricity. • Because of this irrefutable fact, wind farms have to be supplemented by alternative sources; lately these have been new gas-fired stations. • Because of the harsh environment in which they are sited regular maintenance will be required and not all of the turbines will be operational 100 per cent of the time. • Wind power cannot be turned on and off to fit with demand. At times of low demand the turbines might be working at maximum capacity when the National Grid does not require the power input. When demand is at its peak the wind may not blow. How does this compare with a nuclear plant such as Sizewell B? • The Sizewell B PWR generates 1191 MWs (Sheringham Shoal 317 MW at max output). This is sufficient power to supply the domestic electricity needs of Norfolk and Suffolk – 2.5 million homes. This equates to just under three per cent of the daily energy needs of the UK. • It is a dependable source of power. A nuclear power station can generate electricity 24-hrs a day if required to do so. • It is flexible as regards output. The supply to the grid can be adjusted to meet demand. • The negative aspects of nuclear power are of course the risk of accidents and the disposal of waste. The accident rate is comparatively low when compared with other industries but the possible effect on the local population of a major accident could be catastrophic. • The problem of nuclear waste disposal has not been satisfactorily resolved. • Security: the threat of a terrorist attack on a nuclear installation, although unlikely, cannot be discounted. In the foreseeable future the government will follow the policy of creating a diverse low carbon energy production environment. This is going to be extremely expensive for the taxpayer due to the large subsidies that will be paid to companies engaged in building and running the new installations. Over the next ten years £100 billion pounds of taxpayers’ money will be spent on wind farm subsidies alone. It is accepted that our reliance on fossil fuels must be scaled down significantly over the years ahead and the move to renewables is inevitable. In my view this will have to be supported by nuclear power if we are to continue to satisfy the growing demand for electricity. 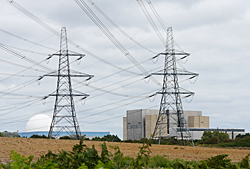 At the present time, EDF Energy, in partnership with Centrica, plans to build four new EPR reactors (third generation PWRs) at Hinkley Point and Sizewell. They will have a combined output of 6.4 GWs. Will a nuclear power station ever be built on the North Norfolk coast? That is unlikely at the present time but if there is a rush to nuclear at some point new sites might well have to be found. If it were to happen would the tourism industry be adversely affected? The Suffolk Heritage Coast, where Sizewell and the RSPB reserve at Minsmere is situated, does not seem to have suffered in that regard; anyone that has tried to park in Southwold in August will testify to that. If it does ever happen the coastal skyline will certainly change and nearby properties will lose some of their value. The prices of those desirable North Norfolk holiday cottages would initially decrease but would soon recover. This would be regarded by most individuals as a small price to pay to keep the UKs lights burning. It is said that there are only two certainties in life, death and taxes. I would suggest that we should now add another; regularly increasing energy bills. Edward Davey: Keeping the lights on, bills down and the air clean. Commons Select Committee Report – Energy and Climate Change Committee. British energy policy is a dark underworld of fanatics. Simon Jenkins in The Guardian.